Bob Haro, BMX Plus! march 1982: I grew up mostly in San Diego, but I was born in Pasadena. I kinda bounced all around with my family - my brother and sister and my dad. I kinda moved around a little bit - my parents were getting divorced and things like that. Bob Haro, BMX Plus! march 1982: The reason I got started in BMX is I used to race motorcycles and I ran out of money. That was when I was in tenth grade, about 16 or 17, in high school. I used to work at a little liquor store market for a buck an hour. I was trying to just make enough money to afford a bike (a motorcycle). My dad cosigned and I got a little Honda 100. It was like a street bike 'cause my dad wouldn't let me buy a dirt bike. So I bought that and stripped it down and I used to ride that. Then I started racing it, but everything started getting real expensive. I was still racing motorcycles. By now I had a 125 Honda, an Elsinore, when they first came out. I used to race and stuff and I did pretty good, but I just never did have enough money to be real good. I always wanted to become pro and stuff. I was like the full maniac of motorcycles. I was racing all the time. That's all I did. I'd eat, breathe, and sleep - that whole thing - motorcycles and motocross. I'd ride from the time I got out of school until it was dark. We would ditch gas cans in the field to keep on riding, just so we wouldn't have to stop. And that's when I was racing. I think I was pretty good - I won about fifty trophies in motorcycles. But then I got into BMX by racing my brother's bike. I started riding more and more, and raced one time at the bike shop track in San Diego - right behind the bike shop. I remember wearing the Honda jersey. I used to think BMX was for sissies - I went out there and got blown off! I was the typical kid. I go to races now and I see the kids and they're so hyped up - I was just like that. I remember trying to steal banners from the track. I got caught - I was just nobody. I remember them telling me they were going to pull my number plate - I didn't pay any attention. I had to give the big banner back - it was a Webco banner. Bob Haro, BMX Plus! march 1982: I was riding for Molina's Bike Shop in Stockton. That's when I really got started racing, because they got a team going. I was the first guy in Stockton that had a trick bike. I had a Two Wheelers, Skyway Tuff on the front (black), I had just an alloy in the back, box bars, and I had a square number plate. And then no one had bikes like that - in that town anyway. I was like the first guy that could do 360's on a jump, roll backs, coaster wheelies - everyone was just blown away. I was like an instant hero. That's how I made friends -by going riding- 'cause I'd meet a lot of kids that way - because I'd just moved to a strange town. 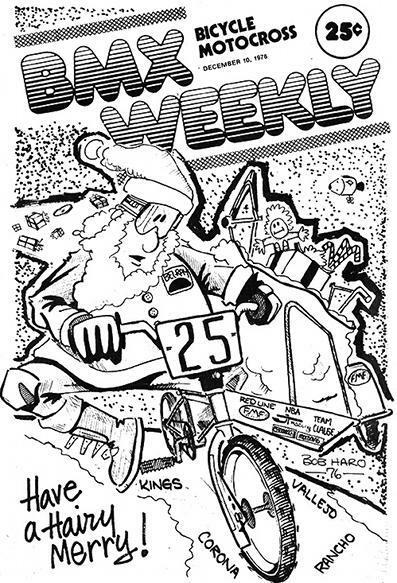 Bob drew the cover of the december 1976 issue of BMX Weekly. Bob Haro, BMX Plus! march 1982: I was living in San Diego. I'd seen this magazine, BMX Weekly. It had these real crummy drawings and I thought, "Man, I can draw better than these guys so I'm going to send in some stuff." So I stayed up late that night drawing on the kitchen table. I remember I drew a couple of BMX guys. I showed them to my dad and he thought they were better (than what they were printing), so I just sent them in. This was just when it was time to move out. My dad had just sold the house and told me it was time to move out and find a place to live. I moved out and about five months later I heard from them - I got a letter from BMX Weekly. They liked my stuff. They said they would take anything I could give them. And I started drawing for five or ten dollars a drawing. Action Now, january 1981: At age 18, Bob was forced to move as a result of his parents' divorce. Raised in San Diego, he decided to try the northern part of the state and moved to Stockton to live with his aunt. (...) His trick riding resulted from not having much else to do in Stockton and due to no other form of transport. He started a team at the Molines Bike Shop and soon was consumed in riding all the time. (...) Bob used to ride his bike at Spring Valley Skatepark. While mainly excelling on his bike, Bob also took the time to learn how to skateboard on vert. A street skater before biking endeavors got under way, he expanded his abilities from BMX park riding to park riding on a skate. The cross between the two broadened Haro's scope to see the similarities between skating and biking. Bob Haro: I was drawing for BMX Weekly and I was really stocked, then BMXA came out and I said, "I'd like to draw for these guys." So anyway, I sent my stuff to BMXA and I got a letter from Oz (Bob Osborn). He said he liked my stuff but he'd like me just draw exclusive for them and nobody else. I said "No problem." That kinda started things. I started drawing for Oz on the fourth issue. I drew, if I remember right, thirty-four issues with him. Bob Haro: On the 1977 SE tour with Scott Breithaupt, I started making number plates and numbers for people because I ran out of money on tour. It then built up real slow. I was just doing it part time -it was just a little extra money. And then I had the idea of making an ad. And I used to go to the races and pass out flyers. It used to say "Bob Haro's Factory Plates-" that's what I was going to call it. And I used to go out with a little thing I made from some rub-down type and a felt pen, and I ran 'em off at an instant printer. I'd go out to the Nationals and I'd walk around by myself. I'd take my Honda car out there and I'd pass out 500 of these -hand them out to everybody. That's how I started getting orders. I'd do a number plate for five dollars, with a number plate, rivets in it, and trick numbers. And they'd send in five dollars. Bob Haro began riding skateparks in San Diego. Bob Haro: It wasn't very welcome; skaters weren't too keen on it. They didn't like it, cos pretty much a skatepark is a skatepark for skaters not for bikers or bmxers, so we got a bit of resistance in the beginning. After a while we were just pretty much a novelty. I think they respected us after they could see what we where trying to do. However, everything we were doing was all on new terrain, trying to carve out all these new tricks was pretty wacky. A lot of the tricks were very skate inspired kick turns, fakies and aerials, and carving the pools that kind of stuff. 1978 BMX ACTION TRICK TEAM. In 1978, R.L. 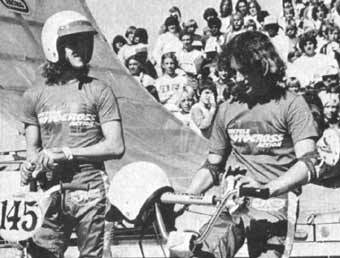 Osborn teamed up with fellow BMXA employee Bob Haro to form the very first freestyle team, which made its debut at ABAs Winternationals in Chandler, AZ. The car is owned and driven by Bob Haro. From left to right are, Donny Jones, Randy Emrich (in the window) and R.L. Osborn. 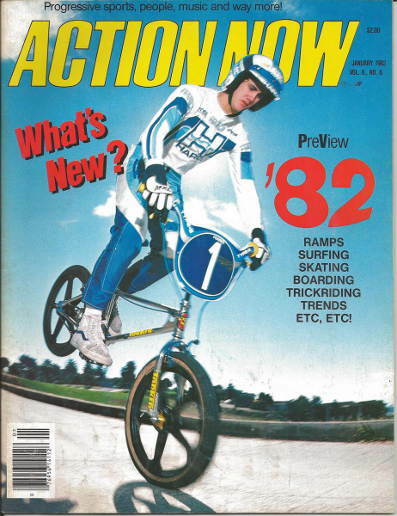 Bob Haro, www.facebook.com, november 2015: My first cover in BMX and in BMX Action Magazine was not of me riding but rather with my not so cool first car. 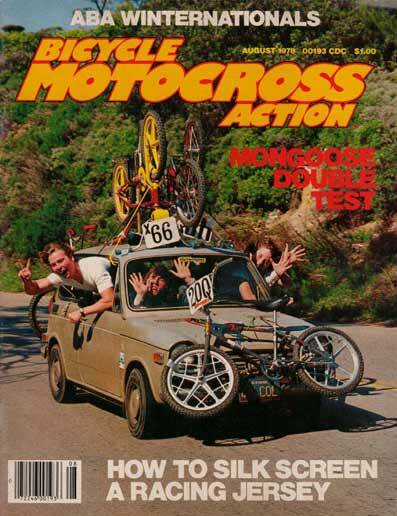 Bob Osborn had us pack into my tiny Honda 600 loaded with bikes and the mighty BMXA test team. At this time cool muscle cars were popular and my car was like birth control to a young teen aged boy. In this photo I'm driving and RL is waving out the window while Donny Jones hangs out the passenger window. I believe the other kid / rider is Emmerick but I may be wrong. To say we had a blast working at the magazine and making magic happen for the soon to be popular sport of BMX would be an understatement. 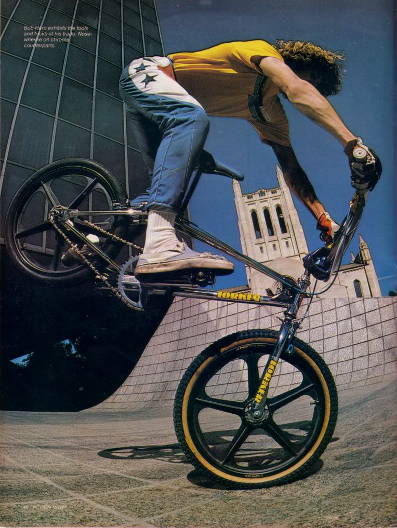 www.vintagebmx.com, july 2005: In the late 1970s Bob Haro was the staff artist for BMXA in Torrance, California. 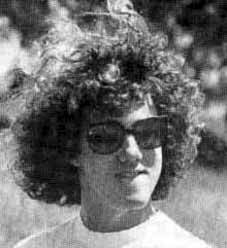 On weekends he would drive to San Diego to ride bikes with his friend John Swanguen. In September of 1978 Bob Osborn saw Haro doing a Rock Walk in the parking lot outside the Wiz Pubs offices during lunch break. Osborn immediately photographed the trick. 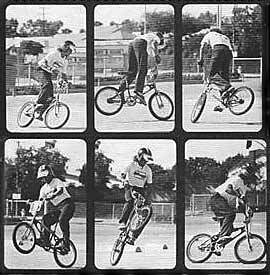 The resulting article, "Trick riding... a whole new thing", was published in the January/February 1979 issue of BMXA. Here is a quote from the article: "Haro and Swanguen used to ride Skateboard Heaven in San Diego, trying to out-trick each other. Gradually the tricks evolved out of the skatepark bowls and onto the flatlands, where they were refined and improved to fit the new environment." The Rock Walk was not just a step up in difficulty over stunts kids had been doing on bikes for decades, it was an evolutionary leap...and it was BMX-bike specific...meaning it is highly improbable that this trick could have been invented on any other kind of bicycle existing at the time. For the above reasons, and because our research turned up zero evidence of any earlier flatland tricks, the Rock Walk is hereby entered into this history as the first documented flatland freestyle trick. 1980 BMX ACTION TRICK TEAM. Little did they know what it'd start. Haro, R.L. and "The Beast". The original BMX ACTION Trick team. Bob Haro had an interview in the 1981 January issue of Action Now magazine. 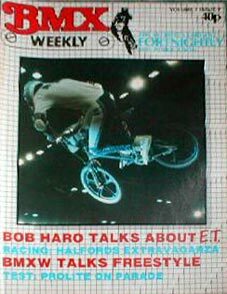 On the cover Bob is introduced as: HARO: BMX Magician. Trickster Turns Executive. Action Now, january 1981: Aside from having his own business, being a top trick rider (along with teammate RL Osborn), and doing cartoons daily, Bob is just like any other action addict. He's heavily into the Ramones, the B-52's, the Motels, Madness, and AC/DC; and gets off on off-roading in his full-race Toyota pick up with an Alpine receiver, Alpine speakers, and a 100 watt power amp. (...) His business keeps him at the office but how many offices have big ramps in them and a 20" bike just waiting for a coffee break? (...) With only 3% of BMX bike owners actually competing, there's a lot of riders who are going to take up freestyling trick riding. Bob is one of the inventors of the sport and continues to lead it with the rest of the world watching and mimicking his every move. Don't say we didn't warn you. Summer 1981. Bob Haro and Bob Morales traveled on tour performing shows all over the Midwest, Eastern United States, and parts of Canada. Bob Haro: The response towards freestyle was unreal, with many people showing a super desire to learn. 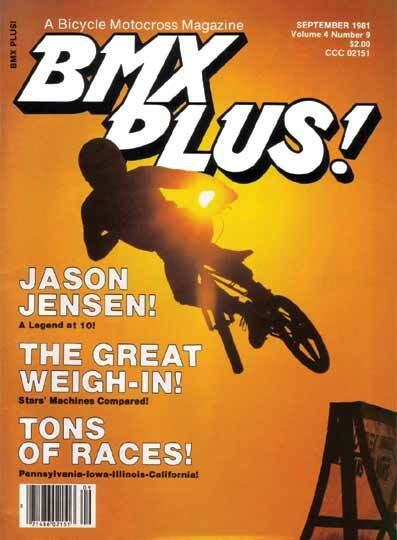 Cover of the september 1981 issue of BMX Plus! Bob Haro is doing stunt work on a BMX bike for Steven Spielberg's next movie: E.T. Bob Haro: It's about an extraterrestrial being that lands on earth. Everything was kind of hush-hush; they wouldn't tell us much. Anyway, this extraterrestrial guy lands on earth, and they're doing experiments or something like, this and one of the aliens gets left on Planet Earth. And these kids find him. What happens is the government officials are trying to find him, and the kids are hiding him. We're doing the part in the movie where the cops are after us, and we've got the alien with us. We're getting chased by cops everywhere, and we end up getting away. They even had parts in the movie where the guys are flying - we're supposed to be flying in the movie. It's pretty neat. We were in the second unit, which is all stunts. I worked five days on the set. I used to think the movie scene was kicked back. Those guys eat well, but I had to get up at five-thirty and be on the set by seven. We'd work from seven in the morning to eight at night - twelve-or thirteen-hour days. I had to do a part where the cops chase this kid (I was playing) up into this house. They're up on the second story - and these houses are all under construction - and I had to fly out of the second story of this house. I built up a little jump. We're supposed to fly and land on a bunch of pallets of wood and stuff and ride away with the cops after us and go down these banks. That was some of the stuff. We had other scenes, like I had to ride over the hood of this cop car and knock off the lights. It was pretty fun - nothing ultra-radical, but it was still a neat experience. 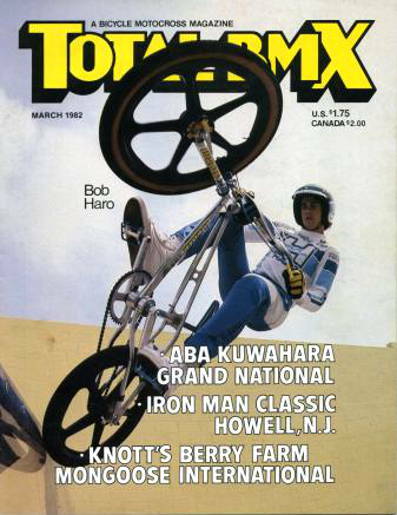 Bob Haro on the cover of Action Now january 1982. Interview in the march 1982 issue of BMX Plus! Bob Haro: I like trick riding. I feel like this is something I started - and contrary to other beliefs - trick riding's something I started, and I've got magazines to prove it. I just feel real comfortable at this. I feel that this is my thing - this is my specialty. Cover and interview in Total BMX march 1982. 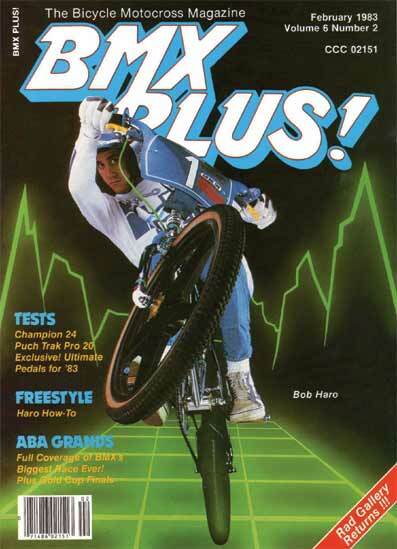 Bob Haro is on the cover of the february 1983 issue of BMX Plus! Bob Haro @ NEC on the cover of BMX Weekly volume 3 issue 7. The Bob Haro BMX Freestyle moves Book shows all the 'original' freestyle moves all performed by Bob Haro. Includes, bunny hop, aerial, rockwalk, framestand endo and loads more. Most photos are in black and white. Borrowing on the design of the Torker frame, Haro introduced the first made-strictly- freestyle-frame in 1983. 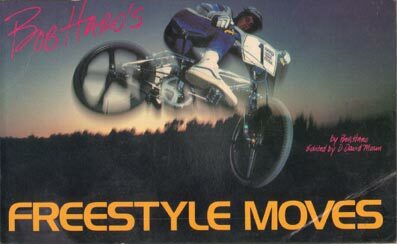 Freestylin summer 1984: Freestyle legend, Bob Haro, is on the move again. This time in a little bit different direction. Haro is starting his own clothing line. lts called, Motives. We had a look at some of his samples and they are TOO HIP. T-shirts with freestyle designs on 'em, logo sweatshirts, Bermuda shorts, surf trunks, and hats. All cool. 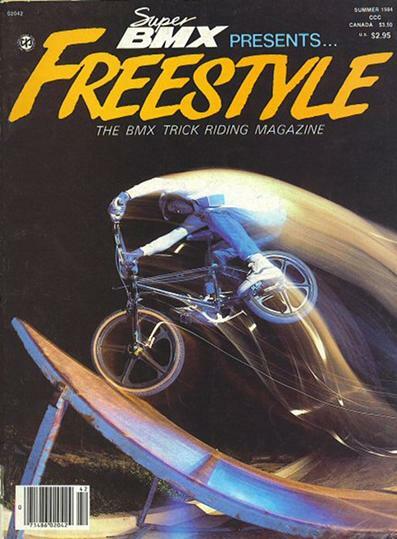 Cover of Freestyle summer 1984. Interview in Freestylin fall 1984. After seven years of being at the leading edge of freestyle as a rider, Bob Haro is hangin' up his pedals and readjusting his sights. He's decided to sit out the Haro Trick Team shows to put his full concentration into running his company, Haro Designs, Inc.
Bob Haro, www.fatbmx.com, august 2003: I think I stopped riding in 1985 because I kept injuring my knee. I had like 4 knee surgeries. I would practice and would feel pretty good and then I'd do something real simple like put out my leg to catch myself and then my knee would blow out. Then I practiced to get back in shape and then I'd get hurt again. And then at the same time, the business was growing and guys like Mike Dominguez got on the team that were 15 years old and you're 25. It doesn't seem like a big difference but 10 years is 10 years of life. You got a 15 years old guy and his warm up air on a ramp is 9 feet out of the ramp and your best air is, not that. You know you're a little hurt so now you're a little more leery. It was like a business decision. I can struggle, or I can concentrate on business. And then the other deal for me was that I think I had quite a good image in the scene as a decent innovative rider. I've seen other BMX riders do it, they don't stop in time and they keep trying to come back and all they do is they lose their good image that they'd built and established because people remember the last impression of you. That's what I thought so I said: "I'm done, I have to stop" and that's what I did. American Bicycle Association inducts Bob Haro in to its Official BMX Hall of Fame. Mat Hoffman, www.expn.com, may 2001: Throughout the 80's Bob, along with his brother Ron "Rhino" took me under their wing in my early days of riding. Bob sent me on tour (where I crashed his tour van about 13 years ago, sorry Bob!) and to most every bike event in the world giving me my start to take his idea and help build it into what it is today. In 1988, Bob sold the company to another bike company but continued a role as a consultant. He continued to design radical, innovative, top-of-the-line BMX and Freestyle bikes and accessories. Bob Haro, november 2014, espn.go.com: After I sold Haro Bikes and my contract was finished in 1993, I had a two-year non-compete. My relationship was and has always been good with my former brand and with BMX, but because I had a non-compete, I couldn't do anything in the bicycle business. In that brief hiatus from BMX, I started a small design and advertising agency called Harodesign. While on a trip in Europe to one of the international bicycle and motorcycle shows, I came upon the Thor motocross booth at the show and spoke with them about design work and if they use freelance designers. I met with their art director, Jim Gallagher, who soon after hired me as a freelancer and this started my career into the motorcycle market. I've been fortunate over the years to have worked with some of the biggest and best names in sports, brands like Penske, Daytona Speedway, Oakley, Red Bull, Nike, Thor, Parts Unlimited and many more. I worked with Haro Bikes for a year or two after my contract expired and provided graphic design for their bike projects. It was a bit strange for me to work as a freelance designer for the company I had originally founded along with being owner and president from its conception. Bob Haro, november 2014, espn.go.com: In 2007, when BMX racing was included in the Olympics, Nike reached out and asked me to collaborate with them to help develop the team uniforms, logos and work as a spokesperson for their Olympic efforts. It was an amazing experience, working with amazing people and a seemingly unlimited budget -- it was one ride I was very happy to be a part of. Interview in Dig #65 july 2008. 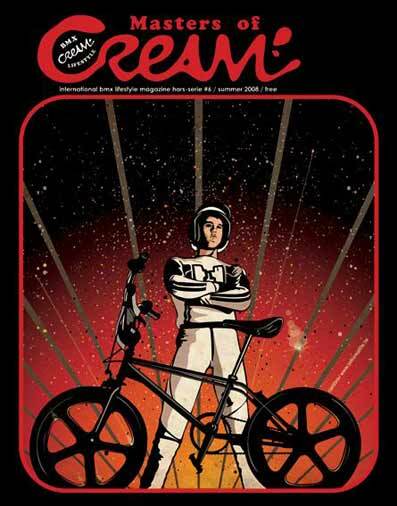 Cover of Cream summer 2008.